SRAM’s new GX groupset brings 1×11 to a more accessible price point than ever. The new budget drivetrain fits neatly between the company’s X1 1×11 groupset and the 10-speed X5 offering, and manages to deliver significant cost savings without losing any of the features that made its single-ring system such a game changer when it was launched just over two years ago. Some of the greatest savings can be found in the new GX cassette. Roughly half the price of X1, the GX uses individually stamped steel cogs held together by 123 stainless steel pins. Expect weight to go up as a result (details haven’t been released yet), but you still get the same 10-42t wide range found on the more expensive groupsets, only in a far more affordable package. It’s worth bearing in mind that, unlike Shimano’s new 11-speed XTR groupset, which uses a standard freehub, all of SRAM’s cassettes mount on a specific XD driver body, and they’re currently around £50-100 extra. Elsewhere it’s business as usual, with an X-Horizon rear derailleur and Matchmaker-compatible shifter. Two levels of GX crank are offered, the more expensive of which is hollow forged, and, for the first time, SRAM is giving the option to run a double chainset up front with associated front derailleur and shifter. 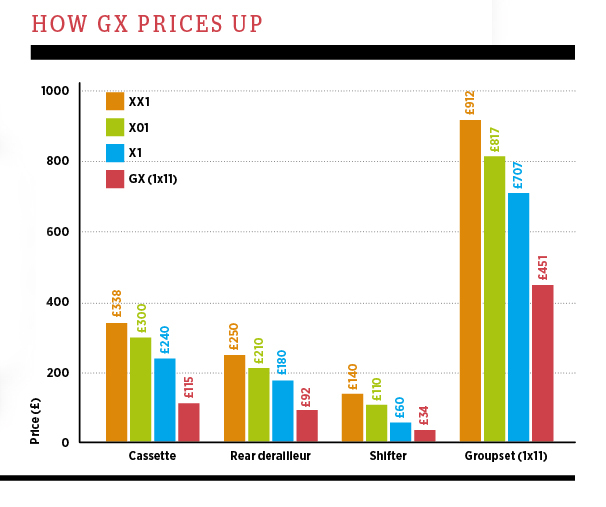 But, while the introduction of 2×11 certainly offers more choice to the consumer, it’s the affordability of 1×11 that has got us really excited, particularly when this new GX groupset begins appearing on 2016 bikes, bringing effective single-ring drivetrains to ever more attainable price points.